Oats are considered as the best healthy food around the world because it is very high in fiber and low in calories. Generally, people think that oats taste good only when they are cooked with spices. Well, this recipe is something which will help you change your perception and do a little experiment with this healthy food. Today, we are going to share a simple oats upma recipe which you can easily serve as a breakfast and snack. Cooked with spices and lots of veggies, this recipe is a great option for the vegetarian and health conscious people who don’t want to add more calories to their diet. First, place a pan over a medium flame and heat 1 teaspoon of oil. Now, add mustard seeds, chana dal, and cumin seeds to the pan. Stir for few seconds and add chopped onion to the pan. Sauté till the onion turn golden brown in color. Then, add ginger and green chilies to the pan. Again, stir-fry for 4 to 5 minutes. Now, add the remaining vegetables to the pan with water and boil. Once the water starts to boil, add oats to the pan with salt. Mix all the ingredients and cover it with a lid. Simmer till the oats are cooked properly. Once it’s done, add garam masala to the pan and again mix all the ingredients. 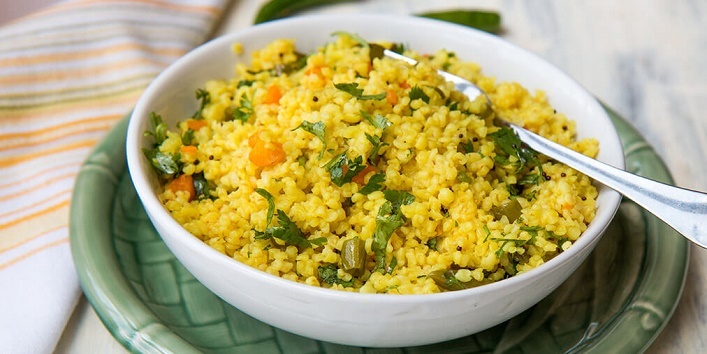 After that, transfer the upma to a separate bowl and garnish with basil leaves and coriander. And your oats upma is ready to be served.